All Hyper Lithium-Ion batteries are built for high performance and are protected from overheating, overloading and overcharging through their triple protection electronics design. Their chemistry allows for maximum performance in temperatures as low as -4 degrees and up to 120 degrees F, so you can confidently use them year-round. 18V Lithium Ion 4-Amp/Hour Pack is rated 3.1 out of 5 by 20. Rated 1 out of 5 by gandalf776 from LSA program on batteries just to make sure i have this right the two 4.0Ah batteries that came with my drill and impact combo the R9205 are covered under the LSA program but the two extra ones i bought AC840087P are not eligible to be covered even though they are the exact same batteries. how does this make any possible sense? i bet if you had the multi tool kit that came with these two extra batteries then you would have covered them but since you were out of stock that was not an option for me. i guess the lesson here is do not buy batteries without tools as they are not covered under the LSA program. Rated 1 out of 5 by MRobbins from Only 3 year warranty Batteries (and chargers) have to be included with another item in order to be covered under lifetime warranty. Really? But you don't offer the dual charger with two 4Ah batteries, which would actually be useful and include warranty. Feel a bit like investing heavily in product line is now a rip-off. Rated 5 out of 5 by Eddybouer from Great battery I saw these at my local Home Depot and figured why not give them a try...I'm impressed with there battery life and quick charge. 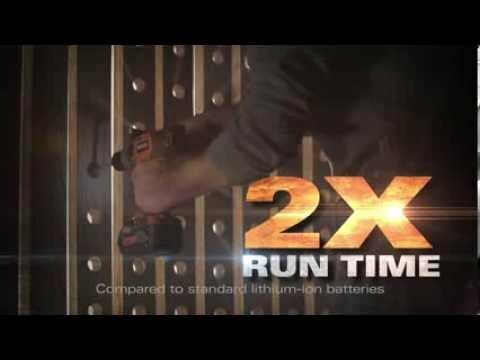 Battery technology has come along way since I first started buying cordless tools. I slapped it in my circular saw and went to town breaking down some sheet goods and was surprised at how long the saw would go as compared to the smaller batteries. This is a great addition to the tools that have a higher battery draw. Highly recommend these batteries for guys and gals who use high draw tools! Rated 5 out of 5 by VeganDan from Great Product from a Pro User Perspective I'm a professional commercial furniture installer that uses the Gen 4 set with extra 4AH batteries purchased separately. For most of my work I use the impact drill. I can usually go the entire day driving many hundreds of different sizes and types of screws and bolts on a single charge. I would estimate that on a typical day I will set around a thousand to twelve hundred screws/bolts. Often times it will be midway into the following day that I need to change batteries. For me recharging time is typically 30 to 45 minutes from fully discharged to fully charged. Have never had any issues with the newer batteries. Perhaps it is the fact that I use the batteries all the time that I achieve great performance results. So for drilling and driving screws, these batteries last all day long. On the other hand when I use the recip saw, I can blow through these batteries in about 15 minutes. My single station charger that came with the set has trouble keeping up with charging the batteries as I blow through them. I was using the recip with a pruning blade to cut the roots out of tree stumps in Florida where the ground is sand. A big project but the recip and the batteries performed great. Same thing with the circular saw. It chews up batteries as well. Its all a matter of how many amps are drawn to operate the tool. I'm hard on my tools as a professional. They get used constantly, permanent home in my car rather than my shop, they get dropped, stepped on, and any other thing you can imagine in a commercial work environment. So far the only problem I have with any of the Ridgid cordless is the loss of the trigger on my drill and the rubber bumper trim coming off of the batteries. One of these days I will take the set in for servicing, probably when one of the batteries finally gives up the ghost. You can't beat the LSA which has sold me on the main reason for continuing to support Ridgid cordless products. These are great tools, great batteries, and a great value for the price and performance a professional desires. Rated 5 out of 5 by DBOCK from Never run out of juice!! I have had two 4 amp/hour batteries for 2 years and have never run them all the way down. I use them on my hammer drill/driver for woodworking projects around the house (drilling pilot holes and driving screws). I have also used the same drill and batteries at work to drill holes in aluminum plate and multiple holes in steal cabinets with 1 inch hole saw. The drill and battery have gotten hot and gone into thermal protection. They only shut down for 5 seconds before coming back to life. Yes, the hot surface warming sticker on the drill is there for a reason. I even used these batteries with the hammer drill to drive 50 Powers 1/2" concrete anchors into predrilled wholes and the battery still had half the life left. They charge quickly as well. Rated 4 out of 5 by HandymannGallo from Awesome battery upgrades Great upgrades from the Regular 2.0 Ah batteries that are included on my drill set. last way longer and gives the tool a bit more power. Can batteries bought on their own or in a pack be registered under the LSA? For example, the new Brushless Gen5X Hammerdrill/Impact Combo kit comes with 2.0A batteries in Home Depot in Canada, where as the site and American Home Depot have the kit with 4.0A batteries. I want 4.oA batteries but want to make sure they're still covered under the lifetime warranty. If I purchase batteries separately and register them in the 90 days, are they qualifying for the warranty? Nope. The batteries are consumables like bits and blades. Their 3 year warranty is pretty generous already. Plus the 90 day return policy. The LSA for the set batteries is just a bonus feature for buying the set. Besides, at some point they will probably be replacing the 2AH batteries with the 4AH batteries under warranty. The biggest danger from the warranty is losing the batteries or having them stolen. Same thing with the tools. Should I Leave the Battery on the Charger or Not? I'm new to this sort of battery and have read conflicting opinions about how to charge and whether to leave the battery on the charger for storage. Because we have concrete walls, I was given a Ridgid X4 Model R86034, but use it only occasionally around the house. What's the proper way to store the battery? I use my batteries daily and have 4 of these batteries that I rotate through on a random basis. It doesn't seem to hurt them to leave them on the charger for days, since I have done that on several occasions. However, the best policy from my perspective is to give them a full charge and store them for awhile, say a month or so, and then use them for a few minutes to draw on the power, then put them back into storage for a month or so, and repeat this process until about half charge. Then I would give them a full recharge. This should keep them exercised without damaging them from non use. In my case, with my collection of Ridgid cordless tools, I don't store batteries for any length of time.